I was born and brought up in Christchurch on a flower farm in Halswell. I had an awesome childhood running around in bare feet, making huts, riding horses, tramping and helping out on the property, living and breathing flowers and nature. My parents started off with an untamed piece of land. They built a house and got to work growing what they could to survive while developing the farm. My father was a soil man and plant propagator, constantly developing the soil and plant breeds, with a huge knowledge and passion for plants. My mother was the tireless worker alongside my father; watering, picking and controlling quality in the bunching shed. When I was a small girl, Dad would try and sneak out at 4:30 am to take the bunches of flowers to auction without waking me, but as soon as I heard the van start up I would run out to the back door, still half-asleep, begging him to take me with him. He'd bundle me and the dog up and we would head off. I loved it! Sometimes on the way back home dad would stop into the butcher, the baker and cheese maker and they would always be delighted with the bunches of flowers he loved to give them – he just beamed when sharing the beauty of flowers he grew. It gave him so much joy. My Mum & Dad, out enjoying nature. Growing flowers wasn’t easy work – very long days, bunching flowers into the night, getting up at 4 am before a frost to light all the kerosene heaters so the flowers which had been nurtured for the past 8 months wouldn’t be destroyed in one fell swoop – but it was extremely rewarding with a high-standard of blooms produced. This is where I developed my understanding and appreciation of how hard flower growers work to get the best blooms. Our home's private garden is expansive, with many unusual, interesting plants and mature trees that were planted over the past 50+ years, a total joy and delight when I visit now. As a teenager at Christmas I would love making up wild and interesting bouquets which I’d wrap in newspaper and bind in string to deliver to friends. After High School I travelled through Europe, living for a while in the same village in Switzerland my father was raised in. I worked in my Godfather's famous framing and restoration business, and while there reached a greater understanding of my father's passion for nature. I returned to NZ and began study at Christchurch Fashion School. Partway through the course I started working at Jenny Burtt Florist and it was there I realised floristry fuelled my creativity and passion for working with textures and nature. While learning under a couple of master florists in Christchurch a friend up in Wellington told me of a florist job there and I went for an interview and got the position. 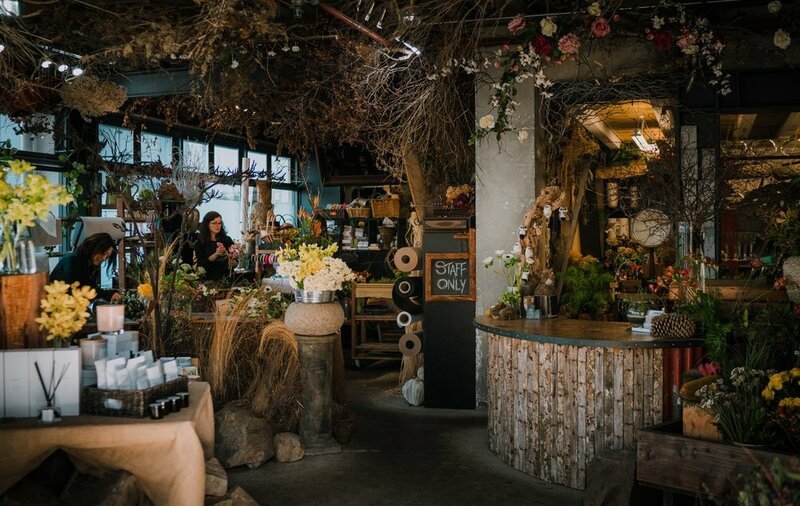 I worked at this busy wee florist on Featherston Street for the next couple of years and fell in love with the hills, views and the creative energy of Wellington. While working here, a dear friend suggested I should start my own florist...so in 1998 on the 1st day of Spring (my lucky wee omen) I started Flowers Manuela in a tiny (but perfect for me) store at 169 Cuba St. My style of floristry was noticeably different at the time and known for its organic, sculptural and eclectic designs. The business went from strength to strength, with great clients and projects. After a couple of years it was time to move to a bigger space – a beautiful heritage building at 216 Cuba St which would be where we enjoyed 15 years and an array of wonderfully diverse floral experiences. In October 2015, due to earthquake restrengthening of the old shop, we moved into our new, strong and up-to-code residence around the corner at 35 Abel Smith St. It is a more modern and open space that we thoroughly love and are happy to call home.